Landscape Oil Paintings : Painting Techniques| Oil Paintings :: How to Paint Realistic and more! Painting Techniques| Oil Paintings :: How to Paint Realistic and more! There are of course innumerable kinds of landscapes. Indeed, one of the joys in painting them is the freedom to choose this particular topography or that genus of shrub, this sort of weather or that thickness of cloud. Sometimes the mere inclusion of a faintly drawn person or wisp of smoke from an unseen chimney can change the whole character of your work. As your proficiency in landscapes increases, so too will your pleasure in their immense variety. Of course this variety also presents something of a problem, namely, which sort of a landscape should I choose for this instruction? 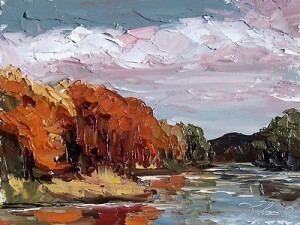 I decided, first of all, that trees are indispensable, though many of my customers do enjoy seascapes as well. Yet seascapes would involve additional complications that would stretch the scope of this article. I decided that a good compromise would be to do trees along a river bank. That way we can practice all the rudiments of a good landscape: grass, trees, sky and water. As I have said, your basic tools are a palette knife and toilet paper. Now, you’re going to be giving the knife quite a workout. Just about every color on your palette will be applied, and both the side and top of the knife are important. The toilet paper will add remarkable form and substance. . But it should also be used to clean your knife as you paint, so keep an extra roll or two available. Soon the motion by which your one hand, holding the paper, cleans the knife in four other-almost after every daub-will be automatic. I realize how eccentric the use of toilet paper might seem. As we shall see, it is a very practical material and using it is not merely a scatological publicity stunt. In my autobiographical remarks I chose to emphasize how in my search to perfect the techniques of Instant Art, I chanced upon the palette knife. Yet anyone who has seen me work will likewise testify to what miracles I can do with a full roll of toilet paper and a good head of steam. It’s a shame you don’t have a donate button! I’d without a doubt donate to this outstanding blog! I guess for now i’ll settle for book-marking and adding your RSS feed to my Google account. I look forward to fresh updates and will share this site with my Facebook group. Talk soon!